If a vehicle rolls over, instability could be to blame. An expert would first calculate the vehicle’s “static stability factor” when assisting with a determination of whether there is a stability-based defect claim. Center of gravity and width of wheelbase are both considered in the static stability factor calculation. 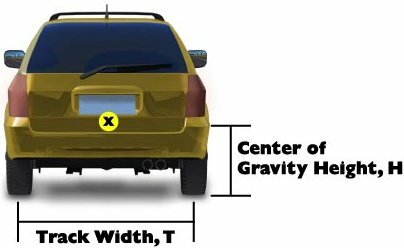 The static stability factor is a ratio comparing the distance between the centers of the two front tires (T) to the height of the center of gravity (H), and is represented by T/2H. The likelihood of a rollover increases as the static stability factor decreases. Vehicles with a static stability factor of 1.2 or less are usually viewed as dangerously unbalanced and unnecessarily inclined to rolling over. Because they are lower to the ground, passenger cars tend to be more stable than SUVs, trucks, and vans. For example, an SUV with a lift kit is likely less stable than a sedan, because the SUV has a higher center of gravity and therefore a lower static stability factor. But that doesn’t mean that SUVs cannot be made safer. Indeed some “safer alternative designs” do exist. For example, to lower the center of gravity, some luxury SUV manufacturers have mounted the engines lower in the vehicles. 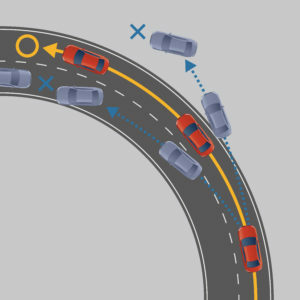 One of the most progressive vehicle stability systems today is Electronic Stability Control (“ESC”). ESC is a general term for electronic structures developed to improve a car’s handling. ESC improves handling and reduces accidents by comparing a driver’s intended direction with the vehicle’s response to steering. The system then brakes and decreases engine power as needed. All ESC systems are based on the same or similar technology, although auto manufacturers call each of their systems by different names. If a vehicle involved in an accident was not equipped with ESC, it is likely appropriate for a plaintiff to plead ESC as an alternative safer design. Whether to plead ESC as an alternative safer design depends on the year and luxury level of the vehicle. Before pleading ESC as an alternative safer design, a plaintiff needs to make sure ESC was innovatively and financially sensible when the vehicle was made. In evaluating whether stability may have played a role in a particular accident, consider that cargo, passengers or even a full tank of gas all affect the vehicle’s center of gravity and lower the static stability factor, increasing the risk of the vehicle rolling over. It is also important to remember that outside factors, such as road conditions, can also affect stability and control. For instance, if a car exits a paved road and rolls when it comes across a steep shoulder mound, it will be difficult to verify that the stability of the vehicle caused the rollover, even if the vehicle is dangerously unbalanced. If a car rolls while on a cemented surface, handling and stability defects should be very early considerations and carefully investigated.